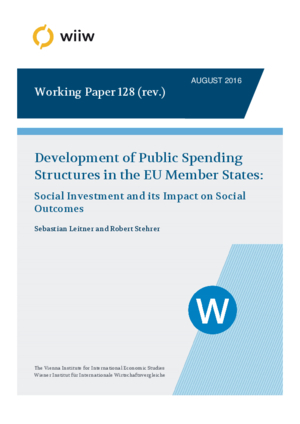 This paper analyses the changes in public spending structures in the EU Member States over the period 1995 to 2013 based on data on government expenditures by function (COFOG) with a focus on social expenditure categories (health, education and social protection spending) expressed in per capita terms in PPPs at constant prices. Expenditures generally increased in real terms, while large differences in spending levels are observed across countries. In EU countries which have been hit hard by the economic crisis cuts have been enacted. The paper also analyses the levels of and changes in individual expenditures on health and education based on COICOP data (Classification of Individual Consumption by Purpose) across EU Member States. In an econometric analysis the effects of public and private expenditures on public health and other social outcomes are examined. Higher levels of public expenditures and lower levels of economic poverty are significantly correlated with superior population health and public welfare.